UPDATE: 12/14/16 – There are now kid’s sizing for this beanie along with a different pattern sequence. Click HERE to check it out! Don’t be fooled into thinking the Made for the Cold Beanie is just another average double crochet beanie. You’ll need to definitely look twice and scroll down to read the pattern instructions. I bought the yarn from my local yarn store, Yarnhouse Studio. It’s their very own hand-dyed yarn and yummy to feel and a pleasure to use for this beanie. I bought it with the hubby specifically in mind. He loves to wear my hats and really does wear them….like wears them out from constant use. So….every year I make him a hat. He asked me if I could make this one super warm where the stitching is closer together. Of course, I took this on as a challenge. I started playing around with the yarn and came up with a “new to me” technique that I thought would be fun. In the end, the stitching produced a “double-layered” hat but without using 2 strands of yarn. You’ll see see what I’m talking about as you get started with the pattern. Once you get the technique down….it’s quite fun and produced a super warm hat that’s Made for the Cold!! Emory actually wore the hat all day today (that’s why the post is so late in the afternoon….he wouldn’t get still long enough for a photo) and said it kept him warm all day on this cold day in Alabama! I hope you’ll enjoy the pattern! Yarnhouse Studio Hand-dyed, 100% Superwash Wool, #4 Worsted Weight, 467 yards, 258 grams. I used approximately 320 yards. The pattern is versatile and you can use any number of stitch count for the pattern to adapt to your size. Round 2: Ch 1, sc in blo in first st, sc in blo of next st and each rem st around, join by sl st to first st. Round 3: Ch 1, ssc (See Special Stitches) in first st, ssc in next st and each rem st around, join by sl st to first st. Round 8: Ch 1, sc in first st, sc in next st and each st around. Round 9: Ch 2, dc in blo in first st, dc in blo of next st and each rem st around, join by sl st to first st.
You can continue working decrease rounds if you so desire. Leaving a long 15″ tail, you will weave in the yarn through the loops of the remaining stitches, pull the yarn tight to close the hole. Fasten off. Weave in the ends. If you need help with closing the hole, I made a video tutorial you can check out. i am having trouble with the join leaving big gap that my son isn’t liking, any suggestions as to hid the join better? You can try using just a chain 3 on the dc rounds instead. I’m not sure that will help but it’s worth a try. Happy New Year Kathy! I’ve never done a hat from bottom up and was wondering when you sc in starting chain, do you go through both front and back loop of chain or just back loop or third loop underneath the chain? I loved doing DJ’s Top Down Guy Hat but thought I give this one a try. Keeping fingers crossed it comes out right…. Hi Nancy, for my bottom up hats, I normally single crochet in the back loop of the chain because it gives such a finished look! Good luck! I’d love to see it when you’ve finished! would there be any way of working this pattern from top down instead of brim up? Yes ma’am. I’m working on a pattern for top down now. I’ll release it within the next couple of weeks. First, thanks for a great pattern! I’m using loops & threads Facets, in Hyacinth (#5) so it’s going to be a super warm thick hat. Once I got the start going without twisting, it’s going quickly? I’m just a little confused as to which side is the right/ wrong side! They both are beautiful. Unless something changes as I go along, is it a reversible pattern? I was wondering if anyone would love the inside just as much as the outside!!! I would love to see it once you’ve finished Sue! My hat is growing wider. I have the same amount of stitches in each row (85 because my husband has a larger head) and I started with a foundation sc instead of chaining and working into chain. Will it close up well as I keep going and start decreasing? I usually work hats top down rather than brim up. Help please! Once you start doing the decrease stitching, it will close up. The hat does “appear” really big but it’s because of the double layering. You still have to consider the inside layer is what is closest to the head. Just to let you know though…..the decrease stitching sequence isn’t going to work out perfectly with your math of 85 stitches. It’s set up for multiples of 8. You can still follow the pattern, but will have some stitches left over each time. If this hat could be made into one or will you have a pattern so. Your patterns are so amazing that I think that what’s would like to use for one of these hats. Thanks for listening. I really love all your work. You can use this pattern certainly. Just don’t close up the hole once you finish the decreasing rounds. Thank you for another great pattern. 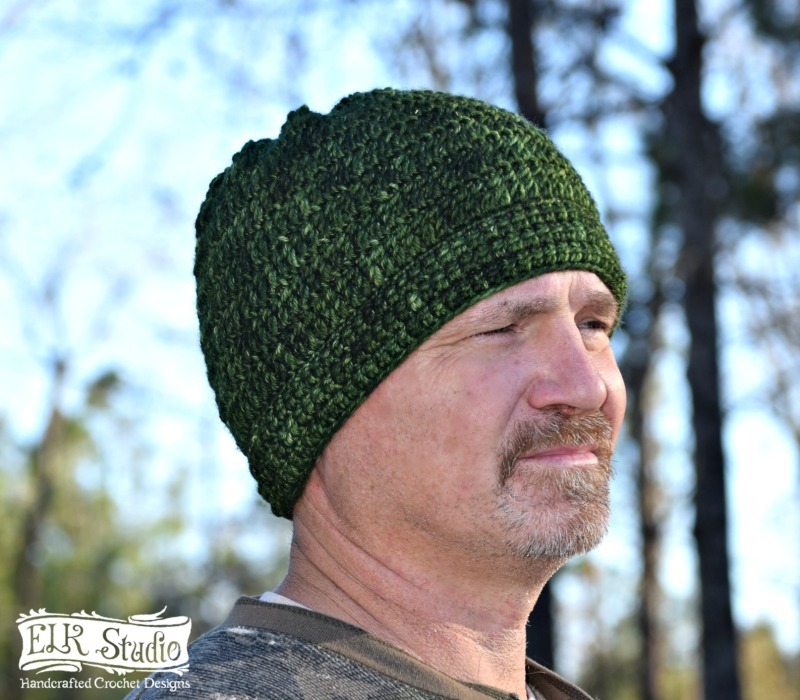 Will you be releasing a video on the SSC and SDC stitches and/or a video of this hat pattern? Yep. I know so many of you are visual. Hopefully soon! Just hang on! As you can see in the photo, it definitely covered the hubby’s ears. Just make sure your hat is closer to the 7 1/2″ mark before you start decreasing. It does get cold here because we have so much humidity in the air we call it a “wet” cold so it always feels much colder than the actual temperature. I’m sure it’s not as cold as Chicago though. I hope your father in law loves the hat! Will this hat still work using Red heart super saver? Yes ma’am. It will be very user friendly to any yarn you choose!!! Thanks! I have a little boy that constantly seems to always missplace his hat. Isnt there a ‘normal’row just 2 rowsunderneath? There are rows you need to repeat. One normal sc and one ssc. The only time you do a normal sc row is Row 1. After that the blo row of either sc or dc would be considered the row that sets it up for the ssc or sdc row. No worries ma’am. I can’t tell you how many times I’ve done the same thing!!! Was there supposed to be sc2tog in this Row that I put in (* *)? Yep. Thank you! I’ll edit it! Of course! Choose those pretty girlie colors and there ya go!!! A girl Beanie all day long!